At the start of January 2018, optimism for our industry was high. For all of 2017, manufacturing in America produced $2.2 Trillion of our gross domestic product. You probably won’t be surprised to learn that Made in America just kept growing! While symbiotic B2B manufacturing transactions are part of the story, American consumers helped a lot. According to a Thomas survey from October 2018 (shared by A2Z Manufacturing Magazine), 61 percent of Americans prefer products made in America. Shoppers in the USA are helping to facilitate this growth by insisting on American-made products. Our industry also became more environmentally conscious this year. For example, a partnership of over 200 manufacturers took part in the Better Plants Initiative. Together, they helped to save $5.3 Billion in energy costs in 2018! The PMI (Purchasing Managers’ Index) according to the Institute for Supply Management said January 2018 started at 59.1 percent for manufacturing. By June, we were at 60.2 percent. PMI dropped to 54.1 percent by December, so the goal for 2019 is to get back to where we were, and higher. Our take on the 2019 outlook? We have some of the best customers in the industry who are ready to take on the challenges of the new year. Whether you’re an existing customer, or looking for manufacturing productivity needs for the first time, let’s start the conversation! Call (877) 611-5825 or fill out a contact form to get in touch with us today! Social media is a building movement in the manufacturing field. This is especially true of the Instamachinist community. This subculture on Instagram shares manufacturing photos and insight with each other. These men and women even share life updates and advice for non-machinist issues. For those new to the social media world, you can find people with similar interests when it is prefaced by a hashtag (or pound sign). 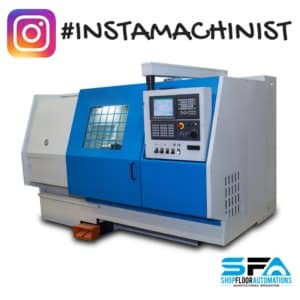 For example, you would look up #instamachinist if you’re in manufacturing. You would look up #cookingram if you like cooking – the list goes on. Manufacturing is an industry where the previous generation of workers is retiring out with younger workers coming in to fill a jobs gap. This means ways of earning business are also changing. Marketing expert and Uncopyable author Steve Miller says in relation to other industries, manufacturing is “more in the middle of the bell curve.” Steve is well acquainted with manufacturing companies – his consultation services for 32 years has included manufacturing trade shows for 26 of them. Social media has had the power to not only be a powerful marketing tool in the manufacturing field. It has also changed many lives. Aerospace. Medical. Defense. Skateboarding?! 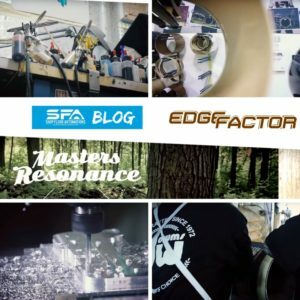 Shop Floor Automations loves fulfilling needs for unconventional manufacturers, so when we learned our customer Professor Schmitt (Paul Schmitt of PS Stix Inc) was going to be the focus of the Edge Factor documentary “Happy Accident”, we were very excited! “Happy Accident” premiered at in September 2018 with a great response. Jeremy Bout and Larissa Hofman of Edge Factor, alongside Professor Schmitt, screened the film for 1100 students during a private viewing at their school in Lombard, IL. Professor Schmitt, his career and his colorful personality are focused on in this film. He has manufactured over 15 Million skateboards and still participates in the sport in his 50’s. He works out of two locations – one in Tijuana and one in Costa Mesa. Though he is very spirited, he takes his craft seriously. The process of making these boards is an art form that is highlighted in the film. First, the board is designed with CAD/CAM. Then we glue, press, drill, shape, router, sand, polish, paint, print, and wrap. Schmitt crosses paths with competition skater Kelvin Hoefler, where a big component of the story is his career return after a massive leg break. Calibration and performance of the boards is crucial, and without spoiling story points, Hoefler uses his senses as a skateboarder while Schmitt uses his expertise together to combat an unforeseen design issue. It’s a fascinating story! Another documentary to check out from Edge Factor is “Full Circle.” The unexpectedly emotional film focuses on unintentional connections we make in the manufacturing industry and how it helps us all fill the manufacturing skills gap. The film is dedicated to the memory of John McCain. 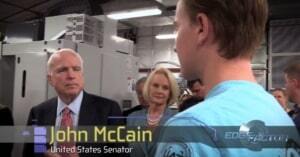 The late Senator was filmed visiting the Advanced Manufacturing Lab of Westwood High School in Mesa, AZ. “I didn’t know exactly what to expect, but I’m just fascinated. I think it’s incredible. It’s wonderful, so I thank you – everybody who is responsible.” John said, when visiting. Visit Edge Factor‘s website for more info on how to watch their programming or help with their efforts. If you would like more manufacturing productivity info, call (877) 611-5825 or fill out a contact form today. MFG Day is here again. A great time to celebrate the growth of American manufacturing. It is also a time to address the issue of bringing a new generation of workers in the doors. In the upcoming documentary “Full Circle” from Edge Factor, the film addresses the oncoming “silver tsunami” AKA the previous workforce soon retiring out. The message is clear – keep developing an action plan instead of continually discussing this skills gap. What are our customers doing to promote our industry? There are different methods we see employed by customers, as well as some interesting colleagues we have made in 2018 that we wanted to share. “I see these kids leave college and they’re in Starbucks or retail, but I feel like manufacturing is really making a comeback,” Ross said. “It’s a very satisfying career.” Ross also goes above and beyond by working a second job as a CNC machinist course instructor at Henry Abbott Tech in the same town that Fuelcell Energy resides! One interesting place to mention is Rise Up. The machine shop in Santee CA is an 18-month long program providing reformed ex-prisoners with CNC machine operator training, as well as life skills coaching, work ethics lessons, and other forms of support. “We tell these guys, they know the stigma that they have attached,” says Machine Shop Manager/Instructor Dustin Greeves at Rise Up. Dustin has been in the manufacturing industry for years and has a lot of insight on the subject. “I tell these guys that they train me as much as I train them.” Keep reading below! There are solutions that can be implemented in shops to help ease the skills gap, as well. There is not only hardware from SFA to help replace old media, but there are also many forms of software that can assist. For example. the old-school generation who do hand coding or write out their G-code can use CAD/CAM to transfer their skills to new workers. 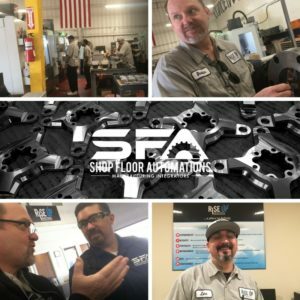 Here are some SFA pieces of product news and MFG Day coverage. Manufacturing Tomorrow especially shared a few of our pieces. For product news, we thank Manufacturing Tomorrow for covering the news of our latest hardware release, the LAN-USB Connect, which adds USB and ethernet abilities to your machine. MFG Talk Radio also published this piece from us – a top 3 reasons list of why moldmakers need to embrace the IIoT. 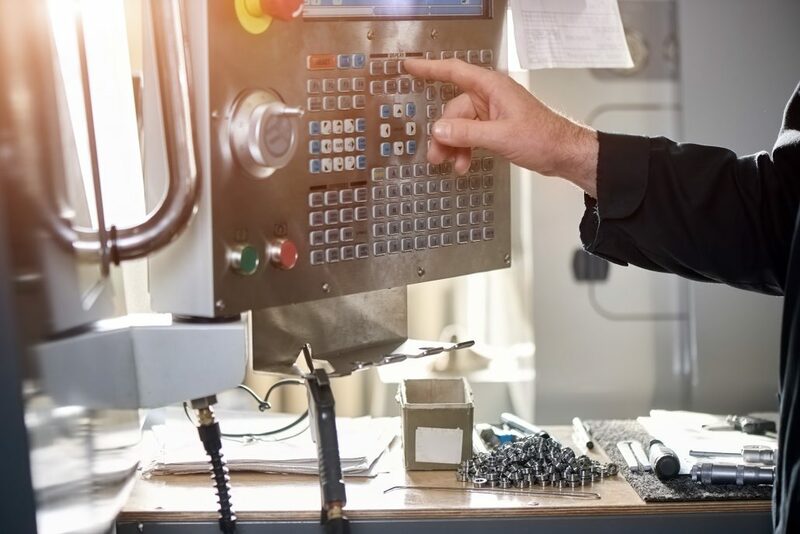 Moldmaking Technology also published an article talking about how machine data collection software helps combat downtime. Finally, it’s never too early to start talking about MFG Day (also known as “manufacturing day”). Fabricating and Metalworking shared our piece last year on shaping the Made in America movement, where we highlighted three organizations helping to make manufacturing great again. 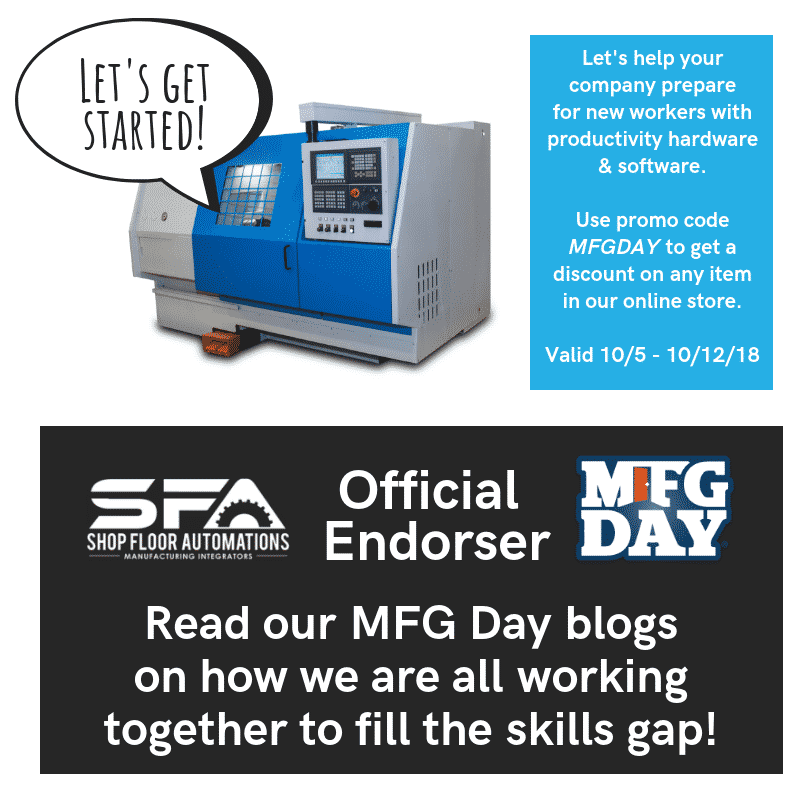 Our newest article from Manufacturing Tomorrow on this holiday highlights three manufacturing companies SFA has worked with and how they are helping to close the skills gap. 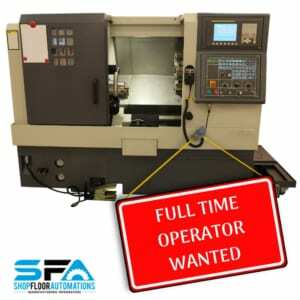 SFA has been helping manufacturing companies increase productivity for 20 years now. Call us at (877) 611-5825 or fill out a contact form! “Titan”: rooting from Greek mythology, it means a person or figure of great importance or power. 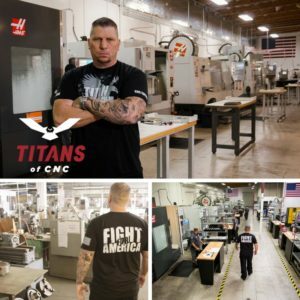 Have you heard of the Titan who started a free CNC learning program called Titans of CNC? Titan Gilroy has created a program that has handed back power to countless people. Individuals who want to thrive in the manufacturing field. Titan grew up with a sordid past and much adversity to overcome. He experienced highs in his life, such as being a Top Ranking boxer. He faced lows such as spending years in prison. Six months of that sentence served alone in solitary confinement. Last week, the long-awaited official trailer for documentary Masters of Resonance premiered. The film follows the path of how a quality drum set is made – from the raw material being sourced, to the concept of the product, to the making of it, to where it actually goes. We first spoke to Jeremy Bout, Founder of Edge Factor, in February of 2017. Masters of Resonance was a big part of the conversation and was highly anticipated, even then. “If I had to kind of pick that catalyst moment, definitely it had to be with Neil Peart, the drummer of RUSH,” Jeremy told us, about the film. “His statement was a pretty major one for me because when I started the process, I was building a TV show, and after the statement and processing what he said, I realized it was [instead] a film that needed to be completed.” Read more below! “America is the land of the second chance – when the gates of the prison open, the path ahead should lead to a better life.” Rise Up Industries takes this President George W. Bush quote to heart. The SoCal machine shop provides a re-entry program for ex-gang members. Courses on machining, as well as life skills courses, helps to build better machinists and people. They started small. It wasn’t until May of 2017 that they were able to take on more than two trainees. Their very first graduate completed the program in November of 2017. Check out our video from visiting Rise Up! Rise Up has Haas machines on hand – beautifully produced parts scattered in carts among the shop. The trainees receive machine training and take part in life skills training. They meet with a case manager, have counseling, and even participate in a Friday book club. “I’ve been in mold making and tool making [for years] – I grew up in it,” says Dustin Greeves, who is the Rise Up Machine Shop Manager. “My grandfather owned his own shop for 25 years and I say this trade will give you everything you give it. It may not happen right away, but it will.” Read on, for more info! 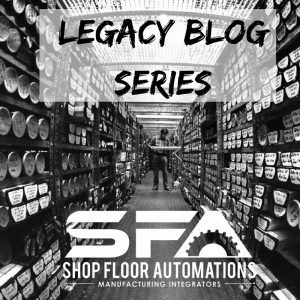 A big focus of Shop Floor Automations is to help customers access crucial, real-time data. We also value historical data for manufacturing productivity. Here is another edition of our Legacy Blog where we cover past media coverage. MoldMaking Technology covered our upcoming 20th Anniversary. Speaking of event-related news, MFG Talk Radio shared our piece about MFG Day 2017, as well as Manufacturing Tomorrow sharing it. Our solutions and how they go hand-in-hand with safety in the manufacturing process was mentioned on the WitzShared blog, which is part of the WarehouseFlow Advisors. Gear Solutions posted our piece on the benefits of machine monitoring software. In an amusing piece of news – our Marketing Coordinator won a manufacturing talent contest last summer for performing a spoof of a Beetles song. AMT also wrote about our comic strip Shop Floor Man in a past update. Fabricating and Metalworking also shared our piece on why spreadsheets are deadweight. If you would like any further information on our solutions or any articles mentioned above, please contact us. Call (877) 611-5825 or fill out a contact form. Preparing military veterans for manufacturing jobs is an amazing way to give back. 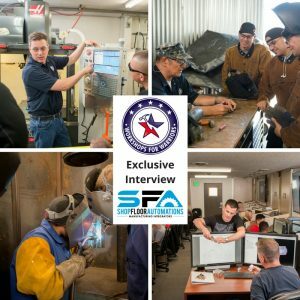 Are we preparing them for the MFG skills gap? One school is. When military veterans return home, they will face a series of challenges. Among the most important of these items to tend to – finding a career once their time in the military is over. To coordinate with the MFG industry needing to fill a skills gap, Workshops for Warriors is stepping in. They aim to help with this important issue and support veterans at the same time. Some of you may remember when we visited Workshops for Warriors (WFW) last summer. We also got to interview WFW Founder & CEO Hernán Luis y Prado. Hernán served in the Navy for 15 years, so this topic hits close to home for him. His message has always been clear – that veterans are the perfect group of people to learn how to use manufacturing equipment to fill these jobs. One big concern with the manufacturing industry is the skills/training gap. While much of the problem in manufacturing is attributed to lack of STEM (Science, Technology, Engineering & Math) learning resources for students, there is another looming problem.